This is a comprehensive exploration of one of Canada's most isolated, physically beautiful, and historically/culturally distinct provinces. We are also pleased to include the offshore French territory of St-Pierre and Miquelon in a thorough program through one of North America's most distinct regions. PLEASE NOTE: The land price, single supplement, and any extra nights are subject to a +11.8% Canadian Tax. This amount is not included in the listed pricing. Optional Single Supplement: $1078 USD (number of singles limited). 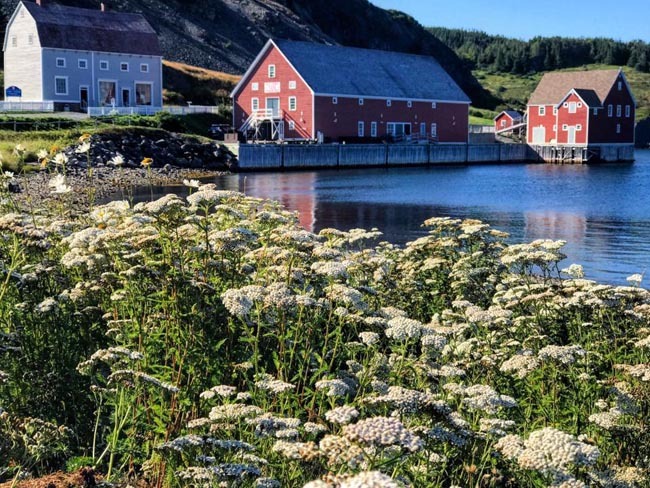 For this Newfoundland & Labrador tour we are delighted to partner with a first-rate local operator whose knowledge and experience in the region ensures a smooth and highly personal and rewarding journey. Join us on a thorough treatment of this unique corner of North America. Great tour. We most enjoyed the visit to St. Pierre & Miquelon. The transportation was excellent with lots of room for everyone. All the room accommodations were great. Our tour leader was very knowledgeable. We enjoyed everything. Our day excursions whether cultural or walking, were all excellent. We were most impressed with all of the local, provincial and federal information centres visited - the knowledgeability of the staff, the design of the buildings and the variety of artifacts on display. The best restaurants and accommodations were used. It was a wonderful two weeks, days and days of experiences to dwell on. The group was compatible and it all went too quickly. Wonderful, great holiday. This was a very good trip to out-of-the-way places. The variety of history and outdoors walking was good. Our tour leader was excellent. St John's was the highlight. Also totally enjoyed St Pierre-Michelon. The small town museums were wonderful. Great tour. I enjoyed all the sightseeing. It was well planned and appreciated the flexibility on some days considering the weather forecast. Our tour leader was perhaps the best tour director, used his teaching expertise,a master storyteller and very attentive to detail. Meals always met my expectations. Local guides were well informed. Great tour. We enjoyed the geology, unique sites such as oldest grave in North America, and St Pierre et Miquelon was fabulous. The coach was very comfortable. Our tour leader was excellent and our local guide in St. John's was very knowledgeable and witty. Today we arrive in Deer Lake (airport YDF) on Newfoundland's west coast. * Transfer to Corner Brook (45 min), Newfoundland's second largest city with a population of 30,000. * LAND ONLY passengers are not entitled to arrival transfers. Please ask your Tour Consultant for Corner Brook transfer times and per person costs. LAND AND AIR passengers' transfers are included in their tour cost. Today we set out by private motorcoach along the sheltered west coast of the Northern Peninsula, via Gros Morne National Park, a World Heritage Site. After a stop at the park's visitor center, we continue along the Viking Trail through the lands the Norsemen tamed and settled over 1,000 years ago, dotted with spectacular mountains and forests, rivers and lakes. 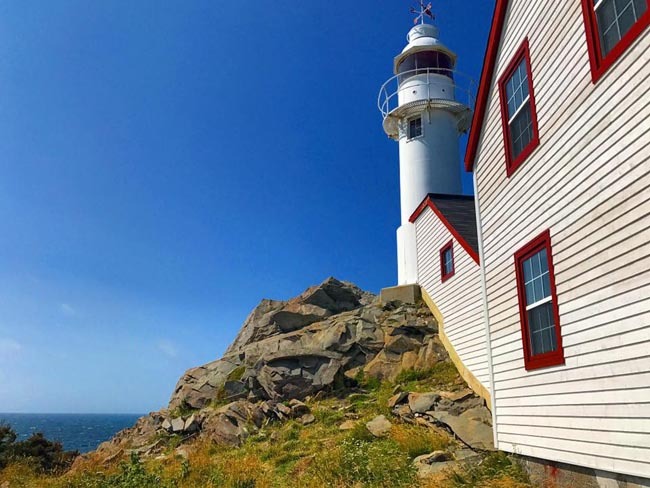 We stop at Lobster Cove with its lighthouse and fascinating marine display. We also enjoy views of the famous Arches carved by eons of pounding waves. The day ends with with a visit to the Port au Choix National Historic Site. Located on the Viking Trail, this site showcases a 4,500 year old time capsule of rare importance. While prehistoric coastlines have long since slipped beneath the encroaching ocean, the raised shoreline and alkaline soil conditions at the site have combined to preserve rich vestiges of the ancient Maritime Archaic Indian, Groswater Paleoeskimo, and Dorset Paleoeskimo First Nation cultures. Within the Visitor Centre are displayed original artifacts, interactive exhibits, a diorama of an archaeological site of a Dorset house, a topological model indicating the area's ancient beaches and a short film. We continue to Torrent River for dinner and overnight. 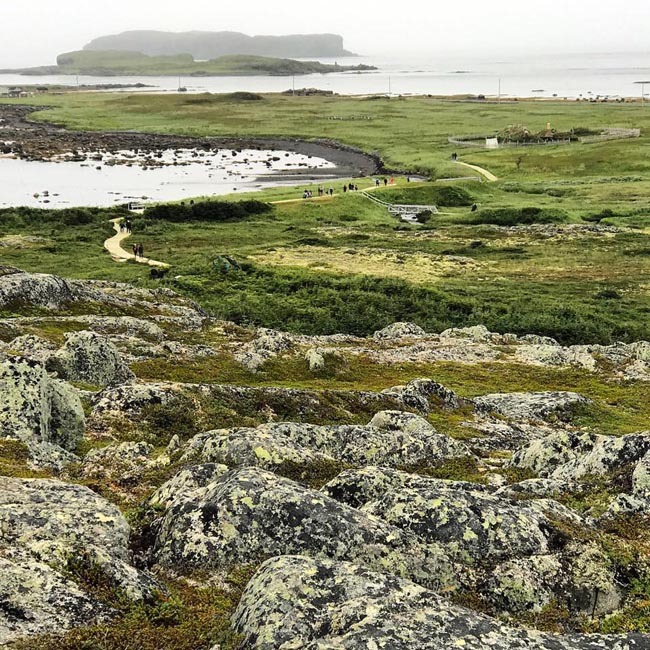 The highlight of our excursion north is a visit to L'Anse aux Meadows Historic Park, the oldest European settlement in North America, and World Heritage Site. Thought to be the elusive "Vineland" of Norse legends, the L'Anse aux Meadows site features overgrown mounds (excavated in the 1960's) which turned out to be the foundations of eight sod houses of the type the Vikings built in Iceland around AD 900. Evidence of ironwork and carbon-dated bone and turf place the settlement at about AD 1000. We tour the sod-house foundations with a local guide. Next is St Anthony, home of the Grenfell Mission. We visit the Interpretation Centre and browse the unique craft center. Today we get a closer look at some of the earliest settlements in Canada. We ferry across the Strait of Belle Isle, known as Iceberg Alley, to the fishing village where Jacques Cartier first landed at Blanc Sablon, Quebec. We then continue by road to Red Bay, Labrador, a community where one of the earliest industrial complexes in the New World – a Basque whaling station, which we visit – has been declared a National Historic Site. Archaeologists have discovered several shipwrecks from the period of 1550-1600 when this was the world whaling capital, supplying Europe with oil for lamps and soap. Archaeologists have also uncovered an astounding number of tools and personal effects that confirm European habitation of this coast during the 16th and 17th centuries. Many of these are now conserved in the Interpretation Centre. 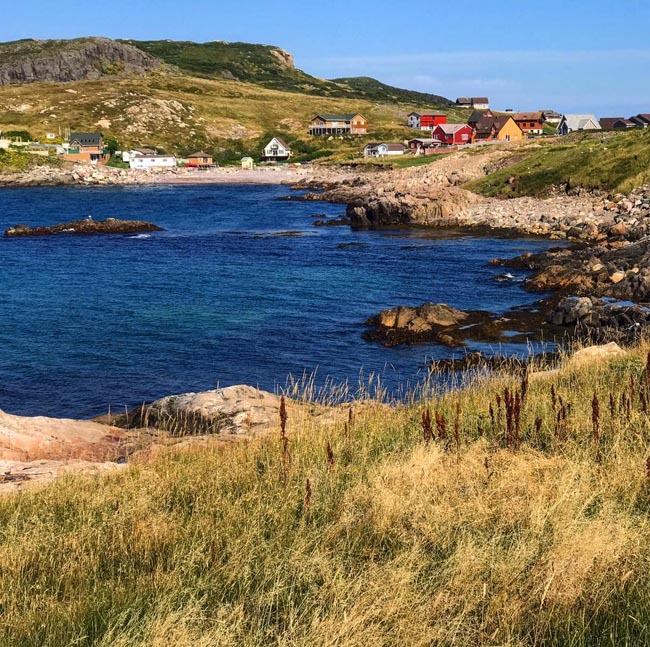 This is part of Labrador's famous Coastal Drive Route; modern-day explorers find a wild land dotted with a few coastal settlements inhabited mainly by the descendants of fisherman who began to settle here 200 years ago. We finish our day back down in L'Anse au Clair, population 264, located 3 km from the Quebec/Labrador border in the Labrador Straits. This is the first established by French fishing interests in the early 1700s; the first permanent settlers were Jersey fishermen. Shortly after the Quebec-Labrador border dispute in 1825, Newfoundlanders and people from the south of England also began settling in L'Anse au Clair. The original name of the community was Anse St. Clair named after one of the first merchants to establish here whose last name was St. Clair. While here, we hope to visit the Gateway to Labrador Visitor Centre. If skies are favourable this evening, you may see the Northern Lights. Overnight in L'Anse au Clair. Today we ferry back across to Newfoundland and continue to Rocky Harbour, located on the t coast in the heart of Gros Morne National Park. Finds of arrowheads in the area indicate that the Micmac once inhabited the area. Then came the fishermen from England and France, some of whom eventually stayed all year round. Today this is the largest community in Gros Morne National Park and is centrally located for touring the World Heritage Site. 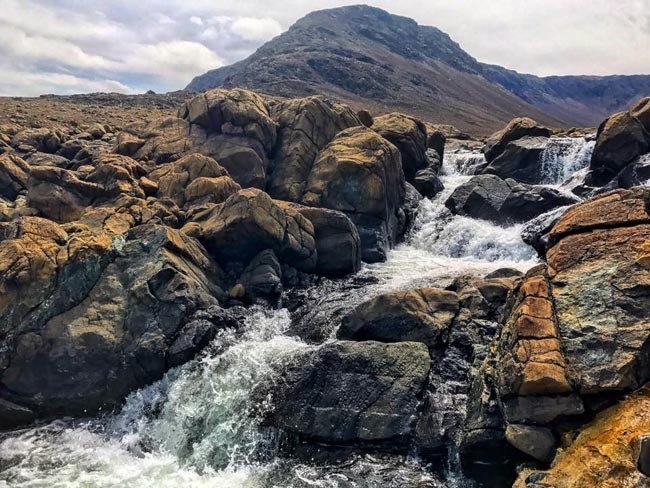 It took Mother Nature 485,000,000 years to mold Gros Morne National Park into the geological and visual wonder we know today. 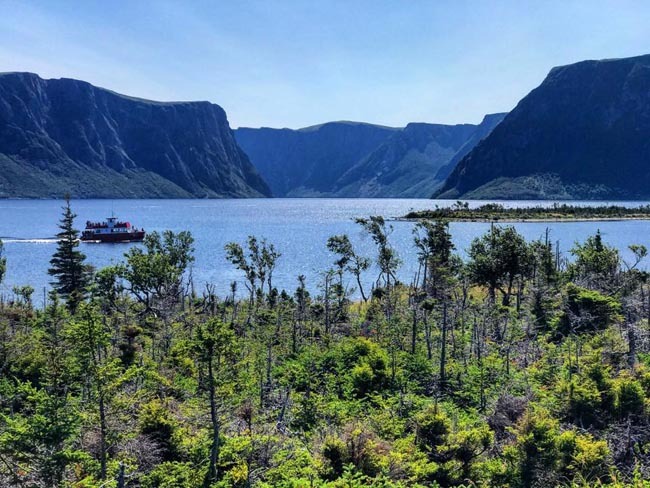 The second largest National Park in eastern Canada, Gros Morne is a UNESCO World Heritage Site stretching across 1805 square kilometres of western Newfoundland as part of the towering Long Range Mountains. Encircled by tiny seaside communities, and encompassing forests, freshwater fjords, bogs, barren lowlands, moose, and striking cliffs and shorelines, this area is also world-renowned for its complex geology. It was here that geologists proved the theory of plate tectonics. This morning we visit the Table Lands in Gros Morne National Park, a mountain of flat-topped rock of a kind usually found only deep in the earth's mantle, is a truly awe-inspiring sight. We enjoy a scenic boat tour (weather-permitting) on which we learn the geology of the Tablelands, see the bald eagles that frequent the deep waters of the fjord, and hear the history of the small villages nestled on the shores. It is an unforgettable experience; some say the scenery is unequaled in eastern Canada. Bidding goodbye to the "Viking Trail," we head south then east through open country dotted with lakes and patches of spruce and pine. Soon we are travelling along the Exploits River and through thick forest country to the town of Grand Falls. In 1768, Lieutenant John Cartwright, while following the Exploits River, named the waterfall he found "Grand Falls"; however, it took until 1905 before the town of Grand Falls was established. Worried about the impending war in Europe, Alfred Harmsworth (Baron Northcliffe) began looking for an alternative source of newsprint for his family's newspaper and publishing business. During their search for a suitable location to build and operate a pulp and paper mill, he discovered Grand Falls. At that time, only employees of the mill and workers from private businesses were permitted to live in Grand Falls. Other people settled north of the railway in a shack town known as Grand Falls Station, which became Windsor, named for the English Royal Family. Today, Grand Falls-Windsor is central Newfoundland's major service and distribution centre with considerable mining and aquaculture activity in the region. This morning we stop at the Salmonid Interpretation Centre to view one of North America's largest Atlantic salmon enhancement projects. 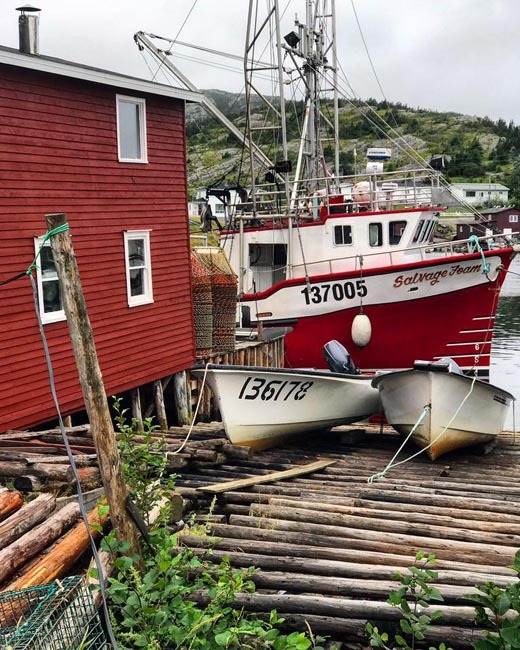 We continue to Twillingate, one of Newfoundland's oldest seaports, first settled in 1700 and now with a population of 5,000. 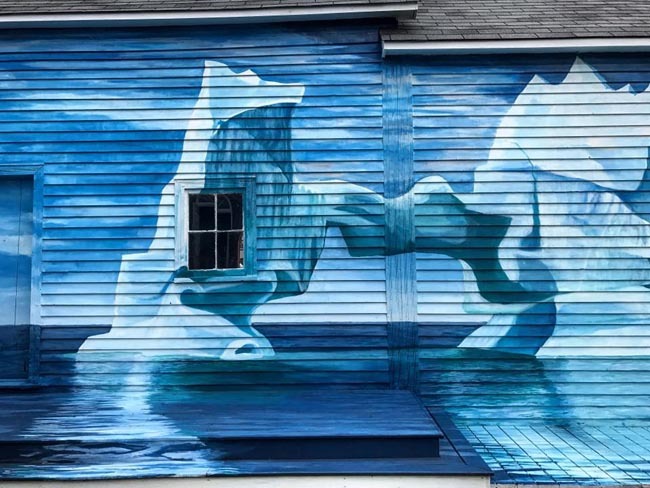 Twillingate's location puts it in the path of icebergs drifting south from the Arctic. We visit the Twillingate Museum, with its collection of antiques gathered from the homes in the area. There is also time to shop for the fine knitted handicrafts produced locally. We visit Terra Nova National Park on Bonavista Bay, with its tiny islands, rocky headlands and forested slopes; a brief stop at its visitors center. Along the "Road to the Isles" the local predilection for colourful language comes across with place names such as "Too Good Arm," "Virgin Arm," and "Crow Head." With luck, you might spot drifting icebergs and whales along the coast. Then to Salvage, a friendly little village perched on the rocks around a picturesque harbour, perhaps the prettiest spot in Newfoundland. Fishermen's huts, silver-grey from sun and salt, stand at the end of jetties piled with lobster pots and fishing gear. Clapboard homes are dressed in a variety of colours. We continue to Clarenville, gateway to the Discovery Trail, which extends down the Bonavista Peninsula to Trinity and Bonavista, reputed sight of the first landing of European explorer John Cabot. The trail is a panorama of scenery, historic sites, coastal towns and villages. Today, two of Newfoundland's most famous outports, beginning with the site of John Cabot's arrival. We drive to Cape Bonavista, where Cabot is believed to have first sighted the New World on June 24, 1497. Back down the rugged Bonavista Peninsula is Trinity, which was named by the Portuguese explorer Gaspar Corte Real when he sailed into the harbour on Trinity Sunday, 1500. We stroll Trinity's narrow, tree-lined streets, enjoying the beautifully-preserved historic buildings. This morning we depart Clarenville and head south onto the beautiful Burin Peninsula via the famous "Heritage Run" route. True to its name, the Heritage Run still rings loud with the echoes of colonial industry. The famous Grand Banks, was once a rich fishing ground and was the world's "bread & butter" for centuries. Codfish were plentiful here, attracting first the European fleets and then French and English settlers. 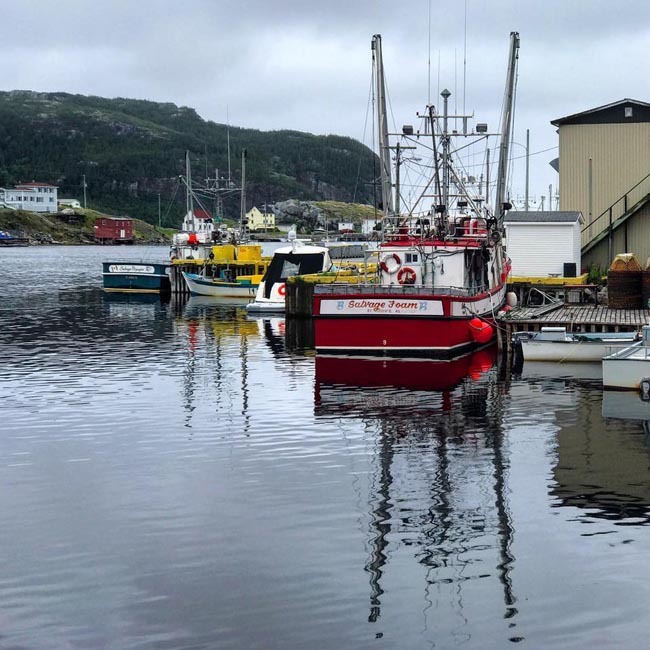 From Placentia Bay's collection of islands and the communities that are tucked into the head of Fortune Bay, to the unsheltered vistas and haze covered French outposts of the peninsula's tip. We travel to the village of Fortune, the departure point for our afternoon ferry to the French islands of St-Pierre and Miquelon (bring your passports!). 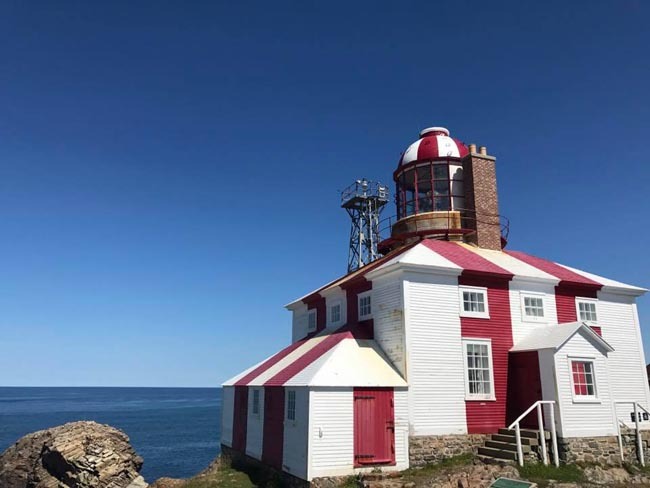 These are two groups of islands with a fascinating maritime history (and their own time zone); they make up a part of France off the coast of Newfoundland. Although many people in North America believe those islands are part of Canada or some type of autonomous region, the islands are an integral part of the French Republic. A specific series of institutions and limited autonomy was indeed granted by France but the islands are and shall likely remain French. Hence, the islands have a decidedly European feel; French is the primary language, plus you'll find French food, customs, and the Euro. During our time on St-Pierre we will have a city / island tour. The "Place du General de Gaulle" on the waterfront, is the heart of the town. It is the unavoidable square to mingle and tap into the "ambiance". The "Zaspiak Bat" or basque playing wall, the "Pointe aux canons" lighthouse, the salt houses, the "Pointe du Diamant" and the last not least the "Arche" museum, are all must-see spots embodying the islands' identity. This morning we depart by boat for an excursion to the island of Miquelon. Miquelon's village, located on a stretch of land to the north of the island, houses 700 people, mostly descendants of Acadiens and Basques. The island is connected to Langlade by a 7.5-mile-long sand isthmus (called the Dune), which was the scene of many shipwrecks. Since the 19th century, these islands have become the center of the archipelago's crop and animal-based agricultural activities, in addition to an important coastal fishing spot. Scallops, lobster, goose and duck foie gras – there's an abundance of delicious specialty foods on these islands! If you’re looking for tranquility, this is a little paradise rich in plant and animal life, with endless landscapes studded with ponds, beaches and hills. We transfer back to St-Pierre in the evening for dinner. St-Pierre is a small but lively harbour town. Music bands and singer/writers are often booked in the city's bar, street performers entertain the passers-by and many summer/autumn activities play a part in giving the town its festive spirit. This morning we will take boat to Ile Aux Marins and enjoy a guided walking tour of this picturesque museum island. On our guided walk, learn about the heyday of the Grand Banks and inshore fisheries. 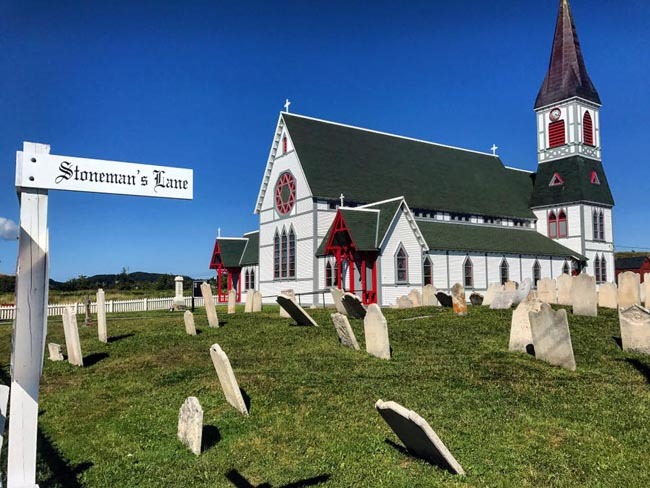 Visit some of the island's historical buildings (the Museum Archipelitude, the church,) see photos and artifacts from the past, and hear stories that will make this a memorable moment of your visit to Saint-Pierre et Miquelon. We return to St-Pierre with the balance of the day at leisure. Later this afternoon we take the short flight from St-Pierre to St John's where we clear Canada Customs (have your passports ready!). The town of St. John's goes back at least as far as the time of John Cabot who according to English seamen's tradition entered the harbour on the evening of St. John's Day in 1497. 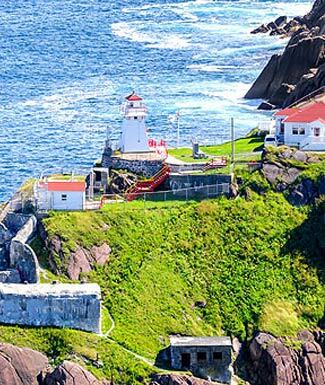 Since then ships of Western Europe came to Newfoundland to fish, and St. John's was a port of call for them all. The King commanded a West Country merchant named Bute to start a colony in Newfoundland. Bute came out to St. John's in the following year and built the first permanent residence on the island. The founding of the town can be said to date from the year 1528. This morning we have a half-day St John's city tour, ending at around midday with the balance of the day at leisure in this charming, photogenic place. We visit Signal Hill, where Guglielmo Marconi received the first trans-Atlantic wireless signal; Cabot Tower, the old town, and the Basilica of St John the Baptist. We also visit Cape Spear. The Glynmill Inn is a melding pot of history and exceptional service, ensuring that your stay with us is truly ...	enlightening experience. 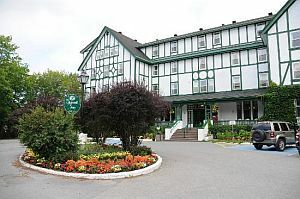 The Glynmill is a stunning structure, nestled amongst the breathtaking landscape of Newfoundland’s West coast. 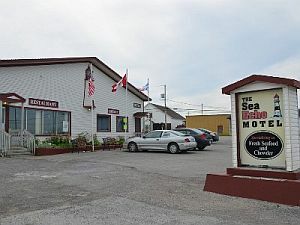 If you're planning a vacation to Newfoundland, you won't want to miss the Sea Echo Motel located in historic Port ...	Choix. 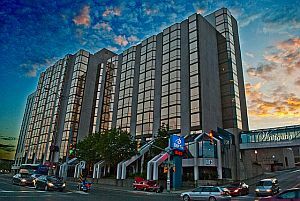 Our friendly staff and famous Newfoundland hospitality ensure your stay with us will be truly unforgettable. 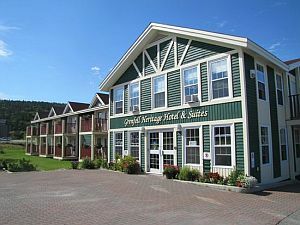 Grenfell Heritage Hotel & Suites is conveniently located in the heart of St. Anthony, Newfoundland. Stay with us in total ...	- while enjoying the serenity of the harbour. 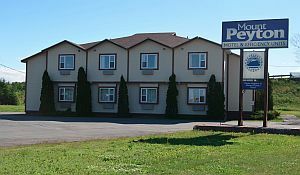 Located in the town of L'Anse au Clair (the Gateway to Labrador), the Northern Light Inn is an ideal base ...	travellers to and from the Strait of Belle Isle ferry terminal and local airport. 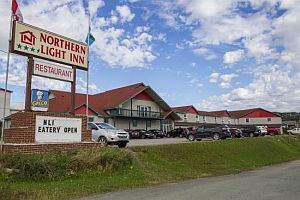 As the region's only 3.5 Star hotel, the Northern Light Inn is open throughout the year to help ensure your stay in the beautiful Labrador Coastal Drive region is enjoyable and successful. Whether you're embarking on a family vacation or travelling for business, the Northern Light Inn can meet all your needs. Our personal service and warm welcome is the very essence of our business. With years of hospitality and culinary experience, we're here to provide you with the best possible stay. From the moment ...	enter and our friendly staff team greets you to the moment you check out after a refreshing night's sleep, you'll enjoy an unforgettable experience. 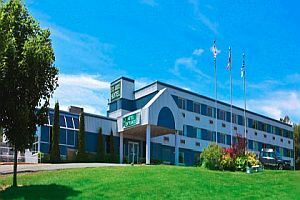 We are a Canada Select 3 1/2 star award winning property located on the Trans Canada Highway in the town ...	Clarenville, Newfoundland and Labrador . St. Jude Hotel provides a great base from which to explore the historic Discovery Trail with its numerous tourist attractions. 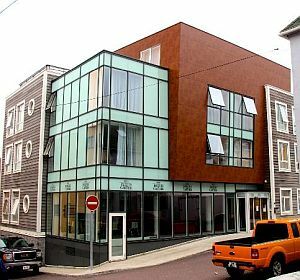 Located in the historical downtown of St Pierre, at a few minutes walk from the ferry service, all restaurants, bars ...	discotheques and a 2 minutes car drive from the airport, the four stars JACQUES CARTIER Hotel is the newest and most luxurious stay in the archipelago. 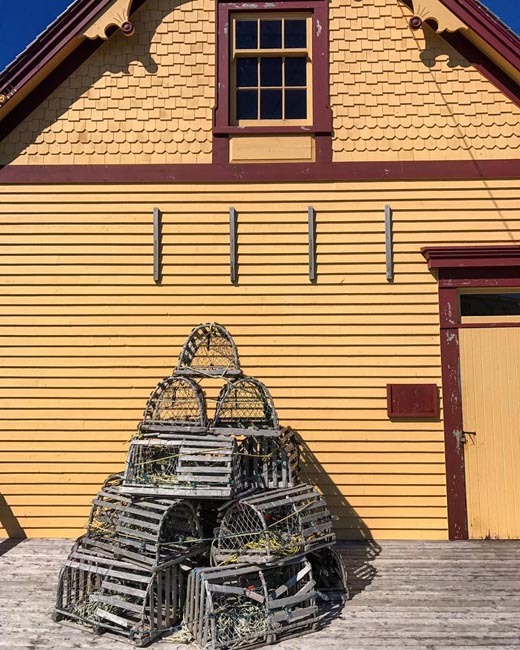 It may be one of the oldest cities in North America, but St. John’s still has plenty to offer today’s ...	Cradled in the harbor and rich with history, culture and natural beauty, the city is a charming destination for work or play. Our downtown hotel puts you in the middle of it all. Breakfast and dinner (hotels & local restaurants) daily. All transport, accommodation, sightseeing and entrance fees for sites noted as 'visited' in the detailed itinerary. Gratuities for local guides, drivers, restaurant staff, porters (if available). Airport transfers for land & air customers and for early arriving/late departing land & air customers who book their extra hotel nights through us. International airfare to/from the tour. Tour Leader gratuities, lunches, drinks, personal items (phone, laundry, etc), domestic and international air taxes (if applicable), any excursions referenced as 'optional'. Airport transfers for Land Only customers. Optional trip cancellation insurance. Our post-reservation trip notes offer further guidance on optional meal costs and shopping. This trip is planned for mid-summer, when weather is at it's most stable and least stormy / rainy. That said, this entire region features some of the most unpredictable and changeable conditions on Earth; one must be prepared for rapid changes in temperature - sometimes all four seasons in one day! We will have a private touring coach for most of our journey; on St-Pierre et Miquelon we will have smaller local vehicles to get around. Local ferry crossings are scenic and relatively short. We have one internal flight via a local air carrier on a light aircraft. This tour is not strenuous per se, but one must be prepared for some early starts, long (but scenic) travelling days, and walking tours on uneven surfaces. You will also have to be independent with your luggage as porters are not generally available for ferries and airports and at hotels outside of St John's. All hotels and inns used on this trip will be a mid-range standard (3-star), with private bath. Due to the isolated nature of some locales, and because there is not a lot of tourist traffic in some places covered, some hotels may be of a simpler standard. We may be divided among two or more properties while on St-Pierre. Our St John's hotel will be well-located and of an international standard. Please note that porters will be available only in St John's (you will need to be independent with your baggage). Full-time, locally-based expert trip leader plus local step-on guides for a day or half day at several locations. We will have one main coach driver and then other drivers in St-Pierre and St John's.